inventolux, this is a great idea, I am all for it. I love the idea of a "gastronomic professional." This reminds me the time I went to Japan and had Edo style sushi. You were seated at a table with your own chef. The chef would set the menu up after there would be some sort of conversation. The menu varied and the pace was very dynamic. Everything hinged on how he perceived your dining experience. This was a great experience. I wish there was something like this in the US. It is a great idea, to have a "gastronomic professional" to be the contact point with the customers. We all know that service staff could use more knowledge, although I have heard nothing but good remarks about the server knowledgability at MOTO, when it comes to presenting what is on the menu and creating a "whole" in terms of the restaurant team. At the same time it would give renewed energies to the culinary staff, because now they have the interaction with the customer with the dishes that they created, they get the instant gratification of seeing a customer go, "wow!". Giving members of the culinary team an opportunity to get the kind of education that a dining room position allows, would/should be really exciting to any culinarian. The tip sharing is a great idea, I wish more restaurants would adopt it. Please keep us posted on how it is going. i love this idea. 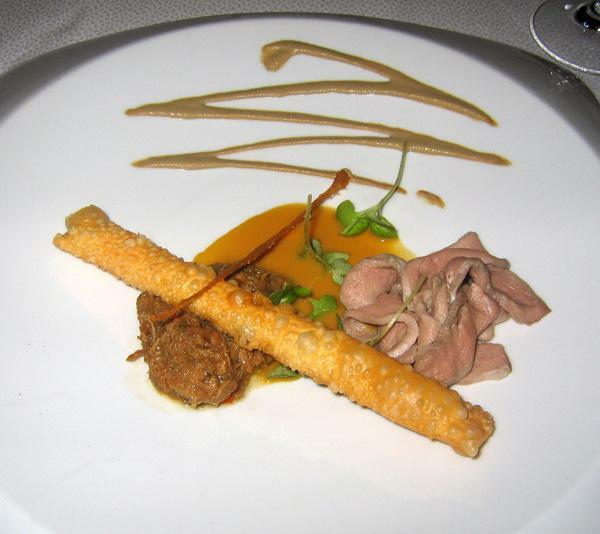 anything that can redevelop the "dining experience" (TM charlie trotter) is good in my book. i wonder if i want to completely replace the waiter/ess thing though. strikes me that you operating costs will be higher if you have all chefs in the place. this comment is based completely on a possibly completely misguided belief that chefs earn more money than waiter/esses. also, does actually being able to create the food necessarily mean you'll be comfortable interacting with guests about it...when i think about some of the chefs that i have met i think it's not the most sociable of professions. hastens to add, not you chef. at what they do if they cooked the food. At moto -- the impossibly hip restaurant in the Fulton Market District -- you'll soon be able to eat the menu itself. i'm going to read willy wonka this weekend so i can finally work out why people keep saying that any innovative food is like willy wonka. An average of 3600 students graduate from culinary schools in north america every year. This poses some long term problems/advantages for the industry. More culinary professionals will likely open restaurants than ever before. Do we contine to follow the template for restaurants in the past? ( 1 out of every 8 fails in the first 2 years.) Or do we take advantage of this stastistic and raise the bar for dining as a whole? I would like to see fewer restaurants and more high quality dining establishments in the future. High turnover and low wages have plagued the business as long as it has existed. A pooling of tips throughout an entire staff would increase a chefs (in the dining room and in the kitchen) wage by almost 20% immediately. An opportunity for a chef to see the other side is something my entire team is very excited about. This provides an avenue to increase the overall quality of life for an energetic culinarian. Could the industry benefit? Yes. Fact: Chefs on average make 36% less than front of the house employees in restaurants with a check average higher than 40.00 and they put in many. many more hours.................................does this make any sense? No. Obviously a chef that is not comfortable in making this transition wont be suitable for table service. However a classically trained chef may not be comfortable in preparing edible menus as well. It takes a special breed, and the rest will fall into place. If a chef is willing to mop floors and wash dishes for the guest, what lengths will a chef go in front of the guest? Whatever it takes. So far the results have been astounding. I admire the level of creativity involved with this project and the constant evolution of thought processes. I do not believe that there is a majority of diners that want this much attention. I do not believe that there is a majority of diners that want this much attention. True, that not all diners would like this level attention, but at a restaurant like MOTO I would think that this is an extension of the restaurant and the type of clientele that they attract would actually relish such an opportunity to "talk food" with their service staff. I have not yet been to MOTO, but from similair experiences at Trio and WD-50 where the waitstaff was incredibly good, knowledgeable and helpful, they did not have the depth of knowledge regarding technique and method that say a culinarian/server would have that you could ask 'how the hell did they do that" and get an answer. One of the things that I enjoy the most when eating at a great restaurant is the opportunity to meet & speak with the chef afterwards. It doesn't always happen for many reasons, but it's a great opportunity when it does. So having the chefs in the front of the house is a great way to enhance the experience even more. Especially at a place like Moto where the food provokes thought & inspires conversation. Who better to converse about the cuisine than those who create the cuisine? When my waitress brought the menu, I told her without hesitation that I was in for the whole ride, to which she responded with a nod and knowing smile. (I’m going to use the words waiter and waitress as shorthand. As many of you know, Chef Cantu has blurred the line between the front and back of the house, so that many of the servers are trained, capable chefs in their own right. I’ll come back to that later.) The “GTM”--or gastronomic tasting menu--featured a variety of courses from Moto’s smaller menus (of four, seven, and ten courses), as well as some unique offerings. I wasn’t sure what to expect and deliberately hid the menu from myself to preserve that ignorance from course to course. 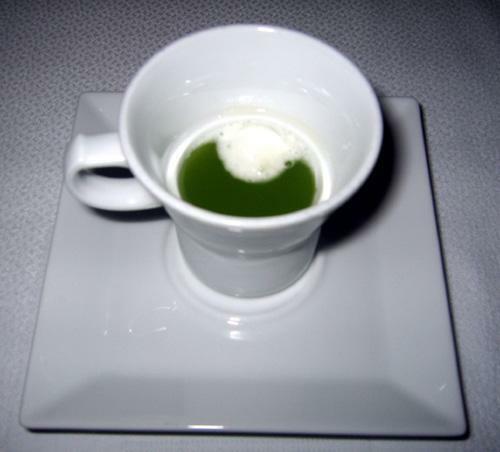 The first course--not listed on the menu, but more substantial than a typical amuse bouche--consisted of a concentrated honeydew melon juice (from an heirloom Japanese variety) floating a dollop of jalapeno sorbet. The melon juice, served a little above room temperature, had a surprising depth and intensity that contrasted effectively with the creamy, unexpectedly mellow sorbet. In this course, as in others, the chef used temperature contrasts to great effect. The second course tied several summer squash preparations together with a subtle curry and a cardamom-raisin vinaigrette. The squash appeared sous vide, braised, dehydrated, and in an anglaise, exploiting many of the ingredient’s flavor and textural possibilities. A very satisfying course. The third course featured an Anjou pear soup, garnished with torn basil and shaved Kalamata olive ice, and a spherical tangle of onion cotton candy. 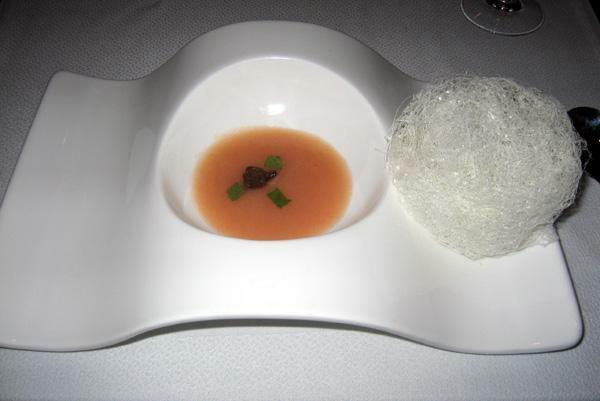 The ball of cotton candy is inserted in the bowl of viscous soup and rolled about, causing the soup to be picked up into the sugar structure (for texture) and many of the oniony strands to dissolve into the soup (for flavor). A whimsical presentation, but the unconventional flavor combinations worked quite well. The fourth course was brought out under cover and dramatically revealed, resulting in smiles, giggles, or, in some cases, nonplussed expressions. 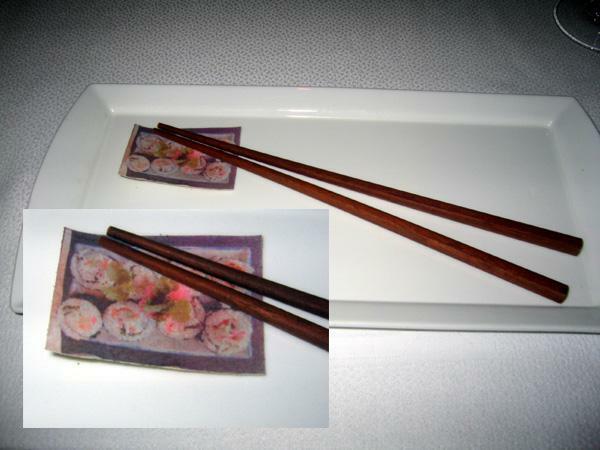 It was “low carb maki"--an edible-ink picture of sushi on edible paper, backed with the dehydrated, pulverized components of sushi. Think of it as a “scratch ‘n’ sniff” for the tongue. As with “scratch ‘n’ sniff” odors, the simulacrum doesn’t quite live up to its referent. But as the paper melted on the tongue, releasing the flavors, it made me grin. The cleverness of the bite made up for any shortcomings in flavor. I wouldn’t order a whole pad of them as an entrée; but in the scope of a nearly twenty-course meal, I can enjoy one or two unabashedly “through the looking glass” dishes. Fish and chips were the fifth course. 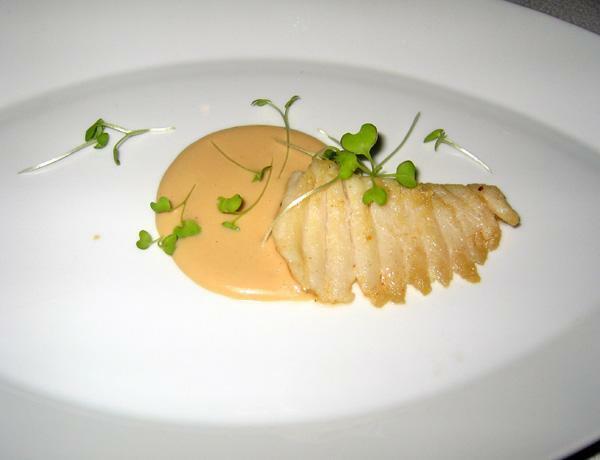 A morsel of skate, sautéed in beurre noisette, was plated beside a tan-colored, silky-textured sauce consisting of pureed sour cream, fried onions, and potato chips. It was a truly great piece of fish. And the sauce (which really did taste of potato chips) had a curious appeal. One of the more surprising courses (in a night full of surprises) arrived next. Announced by the waiter as a caramelized cucumber sorbet, the glistening sorbet ball rested in a pool of sweet cucumber juice and olive oil. As I tried to scoop into the sorbet with my spoon, I met some unanticipated resistance. “Icy sorbet,” I thought, with a scowl. As I pressed a little harder with the spoon, it broke through and sunk easily to the plate. It then hit me: This isn’t a sorbet made with caramelized cucumber, but a cucumber sorbet that’s been encrusted in a thin, crispy layer of caramel! The caramel layer added a different character of sweetness and a pleasant textural contrast. Clever and very enjoyable--one of those tastes that I’m reluctant to rinse from my mouth. The seventh course, and one of a very few that I recognized from the reviews I’d read, consisted of two small piles--one of thinly sliced duck breast (sous vide) and another of duck leg (confit)--bridged by a fried, egg-roll-looking cylinder, plated with two sauces, and garnished with a crispy duck tuile. One sauce was puree of wonton. Another was puree of apple and foie gras. And the tube, when broken open, released a warm sauce of clover honey, orange, and togarashi. Every component of the dish was excellent on its own or in combination with the other flavors in the presentation. For flavor points, this was one of the peaks of the night. 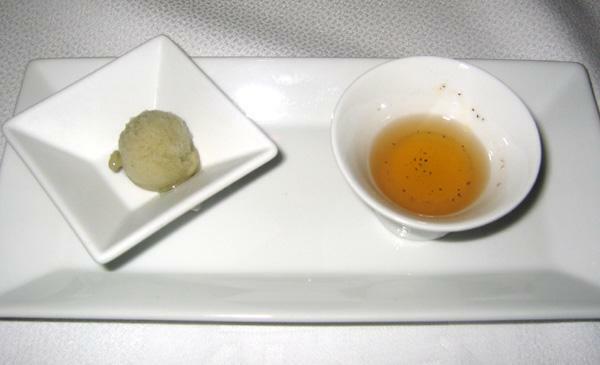 Ah, a palate cleansing course: nori sorbet and black pepper soup. You know how when you stub your toe, there’s always some joker around who’ll offer to slug you in the arm to take your mind off the sore toe? Well, that joker’s in the kitchen at Moto, muscling all the night’s preceding flavors out of the way in a few small bites and sips. Don’t get me wrong; this was a very fine course. The soup--basically black pepper-infused vegetable stock and sesame oil--was more complex and delicious than I would have guessed, given its simplicity. But a rich, beautiful, peppery warmth lingered in my mouth for minutes. An attractive, totally raw slice of Pacific black sea bass (dusted with nori and sea salt) was brought to the table in a polymer box where, I was told, it would steam before my eyes until cooked to perfection. While I oversaw the cooking of the tenth course--apparently, watching a boxed bass will not affect its cooking time; either that or they factor “watched-pot onlooker delay” into the equation--one of the most unassuming, yet greatest tasting courses of the night arrived. Red beans and rice. In the bottom left corner: scarlet runner beans. In the bottom right corner: wild and jasmine rice, topped with a pyramid of red bean ice cream. In the top right corner: shredded, braised veal cheek. 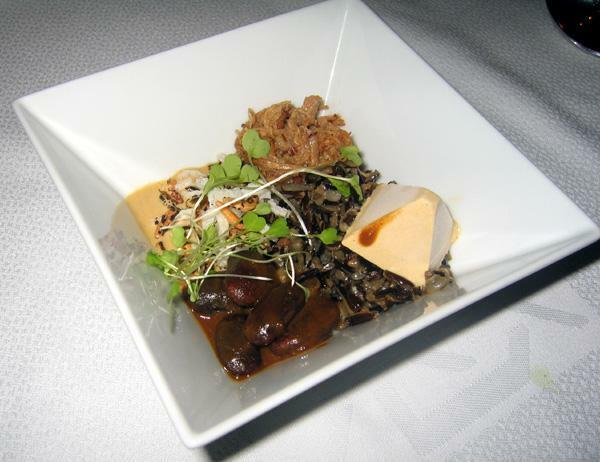 In the top left corner: puffed wild and jasmine rice served over a scarlet runner bean anglaise. This was such a basic-looking dish, but it hit on all cylinders, drawing great contrasts out of hot and cold, sweet and savory, soft and crisp. In tackling classics, some chefs end up gilding the lily. But, in this case, I felt that Chef Cantu was both respecting tradition and making it his own. I could eat this stuff all day long. One of the best things I’ve eaten all year. The waitress returned with a colorfully sauced plate and a spatula, with which she removed the bass from the box. 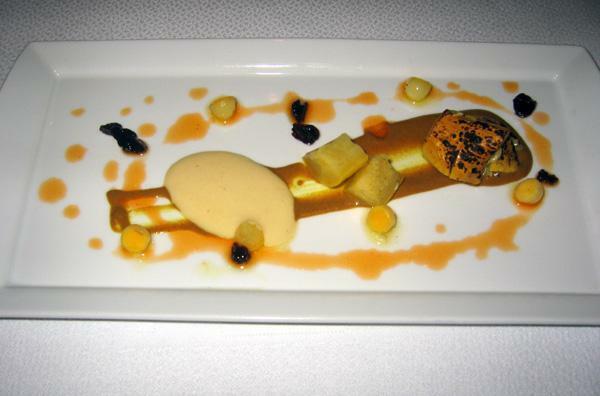 Sauces on the plate included purees of eggplant and of roasted pineapple. 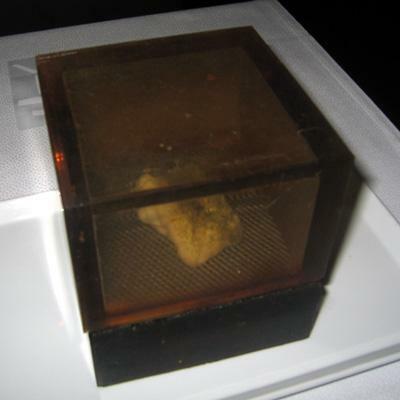 In the corner rested a cube of pineapple cooked sous vide with jalapenos. The sauces were enjoyable and complemented the sea bass well. But the fish needed no accompaniment. 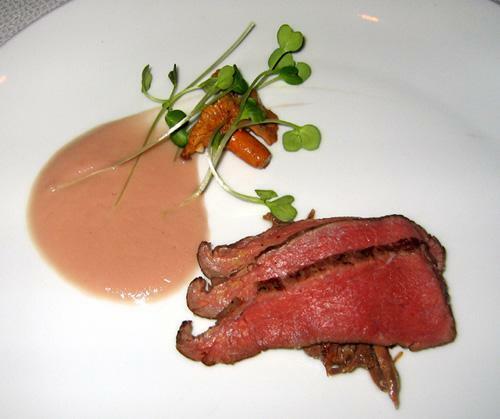 This course featured a finely roasted piece of boneless bobwhite quail, with a trumpet royal mushroom sauce and a liquefied salad of Swiss chard and a vinaigrette made with 50 year old Sherry. The salad, served in a plastic pipette, offered a delightful burst of flavor (even though I felt like I was taking some sort of vaccine). The quail and sauce were conventional, but delicious. The waitress described this course as “Chef Cantu’s interpretation of Texas barbecue.” Chef Cantu, if you ever happen to read this, I’m going to paraphrase Lloyd Bentsen: I live in Texas; I know Texas barbecue; Texas barbecue is a friend of mine; Chef, confit of capon leg wrapped in a wafer-thin slice of sous vide breast, topped with a scoop of fried chicken ice cream and plated with a beet and walnut puree, sunflower seeds, and trumpet royal mushrooms is not Texas barbecue. By that, I don’t mean to suggest that this course was a culinary Dan Quayle. Far from it. I loved every bit of this memorable dish—even the crazy Kentucky Fried ice cream, which I feared might be mere showboating. But even if your hermeneutics are as flexible as a Chinese acrobat, this is no “interpretation” of Texas barbecue. 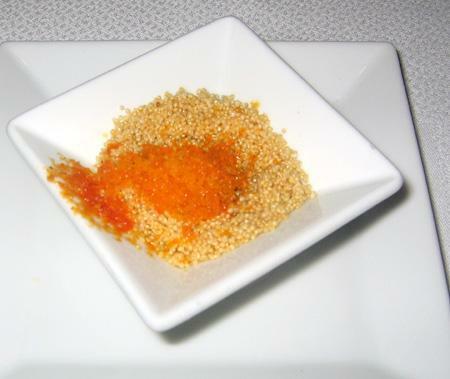 This course, which the waitress acknowledged was a work in progress, consisted of tomato granita over puffed amaranth. It tasted pretty much like what you would think a tomato granita over puffed amaranth would taste like: a little grainy, a little crunchy, alternatively bland and sweet. It didn’t taste bad. But it didn’t taste good, either. It seemed like a rough draft, compared with the more fully developed dishes of the evening. Perhaps the most conventional of the evening, this course featured prime beef tenderloin (cooked sous vide at 130 degrees for a little under an hour, then seared to bring Maillard to the table) served in slices over braised oxtail, with a sauce of pureed red pearl onion and a few butter-sautéed chanterelles. A tasty, comfortable dish. This was a foamed sesame milk soda with fennel, accompanied by a couple of pieces of fennel candy in edible wrappers. The fennel candies were okay, but the sesame milk soda was totally lost on me, tasting vaguely, unpleasantly medicinal, making it the only course (or component of a course) of the evening that I found disagreeable to my palate. Though I didn’t care for it at the level of pure taste, it was an interesting concept. And, in a meal of this scope, having only one item that’s inaccessible to an individual palate isn’t bad odds at all. 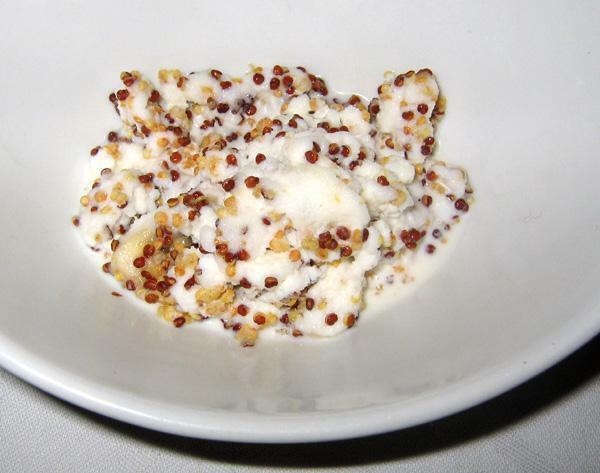 This dish, aptly named “breakfast cereal,” was a bowl of shaved ice milk with diced banana and red and yellow puffed quinoa. It was a fairly enjoyable dessert, though the concept made more impact than the simple flavors. This course, which unfortunately I downed before remembering to take a photo, was a saffron foam soda served over a dollop of cardamom ice cream and small cubes of saffron gelée. While, flavor- and texture-wise, I enjoyed this course, in the context of a tasting menu it seemed somewhat redundant, following hard on the heels of the foamed sesame milk soda and even echoing the opening course’s honeydew melon juice with jalapeno sorbet. Everything else about the meal was so varied that this repetition in form (even though the flavors and textures differed) stood out, like a magician who first pulls a rabbit from a hat, then a guinea pig, then a chinchilla, to diminishing applause. The last major course was “chocolate rice pudding made your way,” consisting of a cup of a rich, thick, milk chocolate soup and a dish of puffed jasmine rice topped with torn mint and a toasted marshmallow. The chocolate is poured over and stirred into the puffed rice, resulting in a gooey mush as the rice softens. The dessert tasted good, but was a (possibly deliberate) step down in the “adventure” department. I would have preferred something more ambitious; but I can see how some diners might wish to end the meal on a homier note. 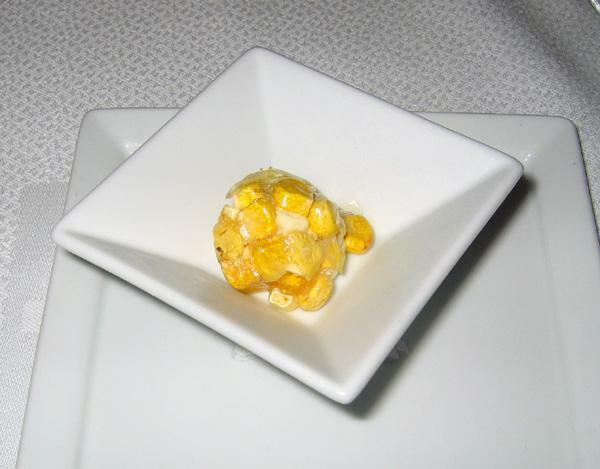 The mignardise was a crème-brulée ball encrusted with caramelized puffed corn. Fun, unique, and delicious, this bite was a fitting end to the meal. Service was, from start to finish, nearly flawless. I was promptly seated, despite arriving early. There were no significant delays between courses, even though I was dining alone (i.e., no conversation) and not drinking wine, allowing me to walk out the door almost exactly two and a half hours after I walked in—an impressive feat, given the number of courses. Wait-staff were polite, responsive, and not at all condescending (even though I may have abused the absence of dress code by coming in jeans and sandals). They were, as you would expect given Chef Cantu’s policy of putting seasoned kitchen hands in the front of the house, exceptionally knowledgeable about the ingredients and techniques going into the dishes. Furthermore, they seemed to take a deep personal pride in the food they were presenting, since they were creatively connected with the dishes and not mere couriers. Near the conclusion of the meal, Chef Cantu visited with me for a moment. He seemed very open-minded to feedback. (I told him that I “didn’t get” the sesame milk soda course.) And, most impressively, he seemed generous in spirit with respect to his competition in the city, going so far as to recommend several other restaurants that he thought were moving in new or interesting directions. An excellent service experience, all around. This was a fantastic meal. In terms of flavor, it was in the top tier of meals I’ve had this year; and, for sheer originality, it was unsurpassed. (For perspective, dinners this year have included a Michelin 3-star and several Mobil 5-stars, including the kitchen table at Trotter’s where I dined on the preceding night.) A question I had, and even posed on this board, before making the reservation was, How does Chef Cantu’s work compare with that of Chef Achatz (whose excellent work I sampled last November)? In an unrelated thread, Achatz once said that when you work outside the box, you place yourself in a smaller box. In a sense, that’s correct. The tendency is to compare Cantu with Achatz, because both are working outside the box. But the space outside the box is incredibly vast, with many uncharted regions. The fact that they’re both “Other” doesn’t make them alike, any more than Lou Malnati’s and Chilpancingo are alike simply because they’re both “non-Chinese food.” And as for which angle on envelope-pushing better appeals to my palate...well, I’ll have to think about that. Chicago’s a beautiful city. Special thanks to all the local food-lovers who so generously shared their time and expertise with me and Extra-MSG while we were in town. Can't wait to come back! Thanks so much for the wonderfully thorough report and the fantastic photos. Your effort is sincerely appreciated. Scott -- DFW, thanx for that detailed report with the exciting photos. It is time for me to go back to Moto, it has been awhile. I noticed that they have done away with the funky flatware. I kinda would like to have seen that evolve. In fact I noticed that none of the plates or bases are made of metal. I wonder why. I wanna try the fourth course. Bravo, Scott! Superior writing, great pictures. I haven't enjoyed a restaurant review this much for a donkey's age. Did you think the numerous sous vide preparations made sense and improved the quality of the dishes? The desserts seem somewhat insubstantial, more like confections and candies. Were they satisfying enough? I know you put a lot of weight on the sweets. Good questions. I'm afraid I don't have good answers. As for the quality, I can't really say, since I've never done a blind taste testing of sous vide v. conventionally prepared ingredients. Since the technique seems to be expanding in upscale kitchens, I assume some chefs have conducted such testing and found that sous vide cooking produces a superior result. I had no complaints with the taste or texture of any sous vide preparation at Moto. As for whether the number of sous vide preparations "made sense," that's more of an aesthetic question. Running down the list, it looks like about a third of the courses made use of the technique for one component or another. At first glance, that seems like a lot. 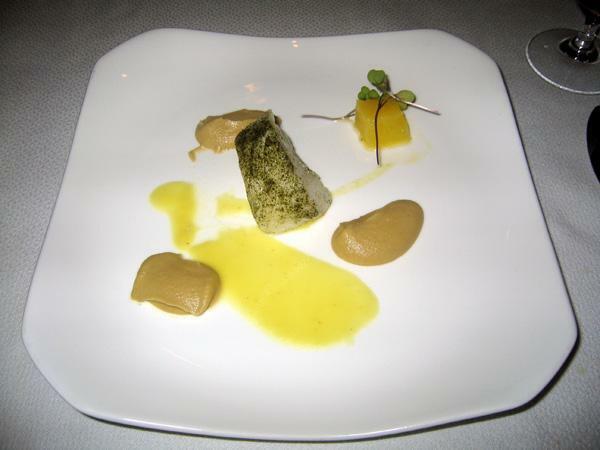 However, in every course in which a sous vide preparation was used (i.e., 2, 7, 10, 12, 14), it was used alongside at least one other technique (e.g., roasting, confit, braising, sauteeing, or steaming). Chef Cantu clearly cooks sous vide more than most chefs. But that's not the only arrow in his quiver. And, particularly in the case of the beef tenderloin, he shows that he's well aware of the technique's limitations. I think desserts pose a special challenge for avant garde chefs--at least for those working in the US. Americans have particular and comparatively narrow palates, when it comes to desserts. While that leaves a lot of opportunity to create unexpected dishes, it also means that there's real risk that the new creation won't be recognized, accepted, or enjoyed as a dessert. This meal at Moto seemed to hedge its bets. 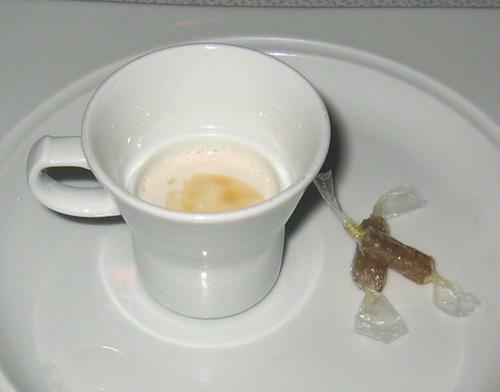 Two dessert courses were more exploratory (i.e., sesame milk soda and saffron soda), while three remained well within diners' horizon of understanding (i.e., breakfast cereal, chocolate rice pudding, mignardise). That seems a reasonable approach. Were they satisfying enough? In the balance, yes. However, the dessert courses at Moto (a) were not as strong as the rest of the meal and (b) were not exceptional for a restaurant of four- or five-star caliber. (The same, I would add, could be said of my meal at Trio in November.) But that slight unevenness did little to detract from an otherwise fascinating and splendid meal. Outstanding pics - I'm curious if the sesame milk was similiar to the soya drinks that are very popular in asian cultures (myself being a fan) it's a distinct and acquired taste. We went to Moto three weeks ago as part of a weekend back in Chicago. While the trip was, in part, to see friends ( we moved to Boulder four years ago after living in Chi-town for ten years), attend a show at Ravinia and to see the new Millennium Park (stunning! ), it was also geared toward a trip to Moto to experience Chef Cantu's innovative, inventoluxian cuisine. So, armed with the knowledge that we were going to indulge fully -- the Grand Tasting Menu is 160 pp and the accompanying wine pairings another 80pp, in a very experimental evening, we went with open palates and open minds, but admittedly high expectations. While I was still struggling to put together this post, Scott has already posted, with pictures of his experience at Moto of a substantially similar menu. I will piggy back on his post (sans pictures) but start out by saying that we reached a different conclusion about our Moto experience. Before delving into the menu (presented to us in a sous vide keepsake), a note on the decor. The restaurant is in the meatpacking district on a non-descript part of Fulton street. No problem with that, but the decor of the restaurant is also non-descript and downright depressive. It is a small, dark space, with beige banquettes along the wall and absolutely no art work. None. This is probably purposeful as to not detract from the presentation of the food, but it is actually quite noticeable and, to this diner, unappealing (also easily remedied if one were so inclined). As noted by Scott, the restaurant was not full, and even thought we went on a Saturday evening at 7pm and stayed until about 10, it never got more than 1/2 full. On to dinner. The amuse was a watermelon juice with nuts and a hint of jalapeno pepper served with our first wine a bracingly dry and refreshing Raymond Henriot Brut Polisot Champagne. The champagne cut the intense sweetness of the watermelon juice in a way that the jalapeño and nut combination were unable to accomplish. The amuse actually signaled what we felt was an overall weakness in the dining experience, a heavy emphasis on sweetness that pervaded most of the items on the menu. I liked the "progression" of squash in its various states and stages. I did not find the curry and cardamom vinaigrette subtle. In fact, I thought the curry was overwhelmed by the cardamom and when the waitperson explained that the curry was made by the chef from a unique blend of over 20 different spices, I was disappointed that more of that effort did not shine through. This was accompanied by a Greek viognier (2002 Domaine Skouras "Cuvee Larsinos") that we enoyed very much and that matched well with the cardamom, curry and squash. Intensely sweet. We are told to dissolve the cotton candy into the soup. Unfortunately, that added more sugar to the already sweet pears and dissipated the onion and olive taste. In my experience, the cotton candy completely dissolved into the soup. I ate a piece of the cotton candy before dissolving into the soup and it has a great mouth feel and more intense olive and onion flavor. with a slight change in the way this is presented for eating . . suggesting that the cotton candy is eaten in small pieces along with spoonful of soups would have really made a huge difference in this dish. Ingenuous. As Scott described in his post . . freeze dried everything on a postage stamp picture of sushi. The taste was very realistic. Very intriguing and unique dish. There was something amusing and yet satisfying about the sauce of sour cream and potato chip flavoring. Alas, the skate wing was over salted (to resemble a potato chip itself?) and almost inedible. The theme of overwhelming sweetness with no offsetting balance is starting to get to us. The sorbet itself is refreshing to the palate temperature wise but again, the cucumber juice is so sweetly concentrated that our palates were not refreshed, just getting fatigued. This dish is a total success. Breaking open the wonton to get to the "duck sauce" and pouring it over the confit and the sous vide duck. The confit was perfectly balanced, delicate and yet full of flavor. The duck breast was perfectly cooked to a rosy pink. There is balance, there is a unique presentation that is whimsical and yet functional, and there is a depth of flavor that had been missing from previous dishes. Perhaps we are just too carnivorous? The Nori sorbet works for me. Intriguing taste sensation as one is not expecting seaweed flavored sorbet but this hits a refreshing note, combined with the slightly warm black pepper broth. We are hitting the center of the meal and feel that Chef is starting to hit his stride with dishes that are better balanced and evidencing a combination of techniques and flavors that work well together. Easily our favorite dish of the entire evening. I completely defer to Scott's description of all the elements in the dish and also agree with his conclusion that he could eat this "all day long". The red bean ice cream was a highlight of the evening . . a savory ice cream that captured the flavors of the beans that were also on the plate. The puffed jasmine rice . . the beginning of a theme, was a great taste sensation, offsetting the smooth ice cream and the delicious veal cheek. The pictures tell the story here. As Scott said, the fish could have been naked on the plate and would have been delicious. 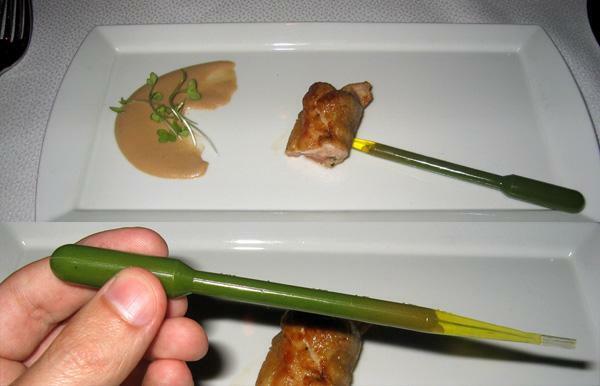 The salad in a pipette. A great smoky flavor in the concentrated liquefied salad. Traditionally prepared quail. 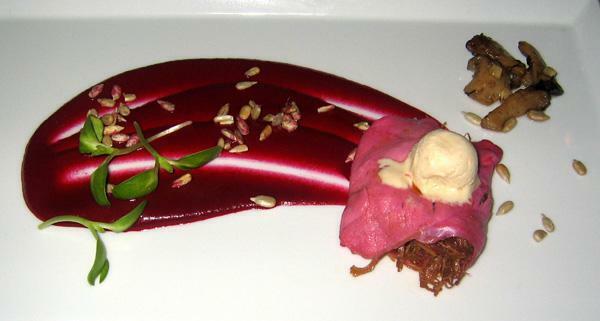 This dish was now the third "shredded" meat item . . capon confit and paired with a sweet ice cream and sweet beet sauce. This dish did not come with the same "this is a new dish" warning that Scott got. It would not have made a difference. It simply did not work. A crunchy mass of amaranth . . think quinoa, with some freeze dried tasting tomato granita. Like dehydrated soup that had not been reconstituted. Maybe if there was some intensely flavored broth that was poured over the dish to bring it to life? I would be interested to know where the beef in this dish comes from. It was cooked sous vide to a warm pink doneness but I am not sure if the sous vide cooking or the quality of the beef rendered the beef lacking in a rich beef flavor. It could be that now that we have been out in Colorado for awhile and actually custom ordering farm raised sides of beef that we are really used to a high quality of flavor. Again, it is paired with a sweetened sauce that for me did not enhance the flavor of the beef or act as a foil for it. It simply was. There was a theme of shredded/sliced meats . . the duck, the braised veal cheek, the capon confit. And now a theme of grains that really felt repetitive. Not one, but three dishes (actually four if you count the rice pudding) almost in a row featuring crunchy grain is simply too much for us and too challenging to match any wines. It is 9:30 and I am having breakfast cereal. An interesting twist, but breakfast cereal nonetheless. It is interesting to me that in his write up, this is the course that Scott identifies as being redundant and the first evidence of repetition in the meal. I actually liked the fact that the dish joined the beginning of the meal with the end and this was the one bit of redundancy that I thought showed an effort to bookend the experience of the evening. It was the internal repetition of the multiple grain courses, shredded meat courses and overall sweetness that I found created the feeling of redundancy and repetition for this diner. Now, I am sure someone will go through all of the courses and add up the presentations and conclude that, in reality, there were only a "few" shredded meats and not every dish had a sweet component, and they may be true. I can only report on what the experience felt like as the diner in the restaurant. Again, the pictures tell the story and although this was creative and fun it was not satisfying as "dessert"
While there were many successes in the evening, most of them mentioned by Scott, overall we felt it was full of too many inconsistencies and repetition. The food, decor, experience simply did not match the cost of the evening, higher than I have ever spent, including dinners at Taillevent, Lucas Carton, Arzak, Trotter's, Mugaritz and others. Normally, I would not mention these other restaurants or strike comparisons between more seasoned chefs and a chef with a new, first ever restaurant, but the prices at Moto invite such a comparison. Chef Cantu has priced himself in the same category as the finest chefs in the world and so I think the level of expectation is created that the majority of the dishes in a GTM are going to be exceptional and we did not find this to be the case. Looking back, had we had the five or seven course menu, which would include the true highlights of the evening (duck pull apart, beans and rice, sea bass, chocolate pudding made your way and one or two others), may have caused us to reach a different conclusion about the experience. The same was true for the wine pairings. Aside from the champagne and the viognier, there was not another single standout wine for us during the remainder of the meal and the wine steward actually missed an entire course. I recognize that we are in the minority here and that some will say that we did not "get" the dishes or that our expectations were too high. I disagree, but that's what makes eGullet, eGullet. Thanks Amy, for the detailed report. I really appreciate you taking the time to provide such an excellent level of detail. I'm sorry your experience at Moto wasn't a better one. One of the things I love about this place is the diversity of opinion. We don't all have to agree on everything--in fact--it'd be a bit disappointing if we did. I recognize that we are in the minority here and that some will say that we did not "get" the dishes or that our expectations were too high. I disagree, but that's what makes eGullet, eGullet. I think you've clearly sketched out some reasonable complaints about your meal. As to your comments about repetition, I had some similar thoughts after my meal there, though I wasn't quite as bothered by them. And, upon further reflection, I'm even less troubled. Why? Because I think the repetition only stands out because the food is unusual. ExtraMSG asked about the seemingly high number of sous vide preparations (i.e., five). That did seem high. But, had this been a traditional tasting menu, would anyone have thought to complain about a little under a third of the courses being *sauteed*? Forms and techniques repeat in almost any meal. But because so many of the forms and techniques at Moto are unconventional, the customers' attention is more drawn to them, making us more cognizant of repetition. The repetitions I noticed most were the soda/sippable courses, the sous vide elements, and the puffed grains. Frankly, the repetition of shredded meats and courses with sweet elements never occured to me. Strange how two people having a very similar meal would find different patterns of repetition. Repetitions of form or technique concern me less than repetitions of flavor. Since the frequent courses with a sweet component (a little over half) stood out to you in an unpleasant way, I can definitely see why you enjoyed your meal less. For me, those courses weren't cloying and usually balanced the sweetness with other tastes that kept me interested and happy. Anyway, thanks for your detailed description and comments! I agree that I did not find the use of the sous vide technique to be over done, since there were differentiations along with each sous vide presentation, for example the beef was seared to finish and not just left as "steamed" meat. If it had not been seared, it may have too closely resembled the duck breast. I think the reason that the sweetness with each dish started to bother us was because it was not, in our opinion, used to great effect to balance out the plate . . for example, in the dish with the capon and kentucky fried ice cream, if the meat had been smoked or spiced in such a way that it demanded a counterbalance, it might have made more sense. Where it worked, was the beans and rice, where the braised veal cheek was full of flavor, tang and smoke and the bean flavored ice cream, while sweet, seemed appropriate. There was a certain lack of intensity, if that is the right word. Now that you put the numbers to it, I actually feel slightly vindicated -- 5 dishes with grain matches my feeling of "what, more grain?" toward the end of the meal. I enjoyed Chef's innovations and creativity and where things clicked, they were really some of the most adventurous taste combinations and preparation techniques that one could want. So, how to combine the desire to have Chef continue to experiment,explore,push the edge but fill up the restaurant and have repeat customers? And I say this, not because of my experience but based on the fact that the restaurant was clearly not near full on a Saturday night, and I think the same held true for Scott's dinner. Here is a very brazen suggestion/query that I had in my original post but then deleted it. Should an experimenting chef consider charging less for 20 dishes when many of them are still, admittedly, in the test stage and the diner is being asked to share in the experiment in order to create a lost leader if you will to get people to experience the dishes or should the grand tasting be pared down so that the supermajority of the dishes that the diner experiences are "successes"
AmyH, I'm interested by your use of the word "sweetness". I find it appropriate, but the things that you apply it to wouldn't normally be considered overly sweet, I don't think: two melons, watermelon and cucumber, eg. It's kind of like complaining about the sweetness of peas, corn, or carrots. Do you think there was added sweetness, like sugar, in those dishes, or do you think maybe it's more an issue with your palate, perhaps? Not a rhetorical question. I mean it honestly. Watermelon is extremely high in sugar and when one distills it down (or if you ever just ate the juice from watermelon) it is extremely sweet. 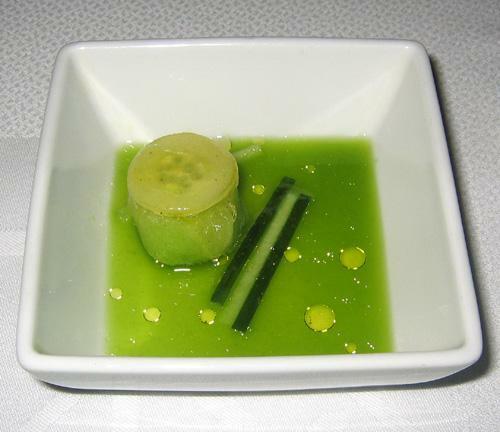 The cucumber was carmelized as described in Scott's post and pictures, so there was sugar added there. The pear soup was sweet, because again pears and pear juice are sweet. Other dishes, even the duck pull apart that I enjoyed, had a non-traditional duck sauce where one of ingredients was honey. The beef was paired with potatoes with vanilla but yet the beef did not have any seasoning at all, so i guess the vanilla was offsetting the savory nature of beef, but it did not match Combine that with the ice creams and I don't think it was my palate. That being said, Scott notes that he felt that the sweet elements of most of the dishes balanced the savory aspects contained on the same plate and here is where our palates definetely diverge. My palate (and that of my spouse) did not pick up enough nuance and I think this is the appropriate word, intensity, of the savory flavors to require the amount of sweet on the plate. Only in a few dishes were the savory ingredients strong enough to create what I felt was the appropriate balance. The beans and rice was one dish. The quail with liquified swiss chard was another. the pipette contained a burst of chard, smoke (liquified bacon?) and vinegar. It's like wine pairings.